Use Conversion Optimization in conjunction with your Facebook Pixel to optimize for on-site events, post engagement and more. Conversion Optimization is an underutilized tool that allows you to get deeper insights from your social traffic and optimize for high value actions from your social audience. Use Naytev Conversion Optimization profiles to test your Facebook and Instagram content and move the needle on your KPIs. Here are just a couple of Naytev Optimization Profiles that you can create to capitalize on the power of Conversion Optimization. There are our default Optimization Profiles that we offer right out of the box. Without any additional setup, you and your team can optimize for Traffic, Video Views, and Post Engagement. 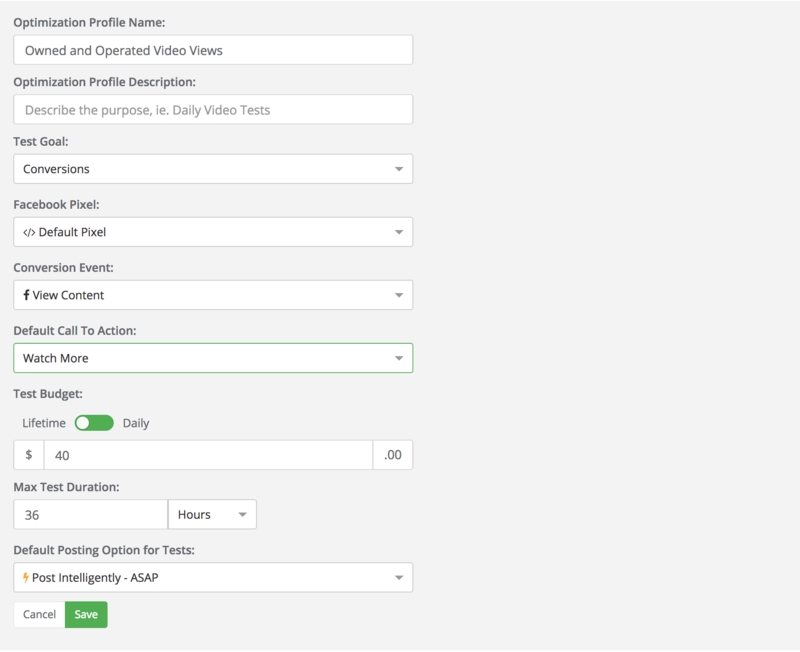 Naytev automatically optimizes for 10 second Video Views when using the Video Views goal. Using 10 Second Video Views is a better way to measure engagement and interest. 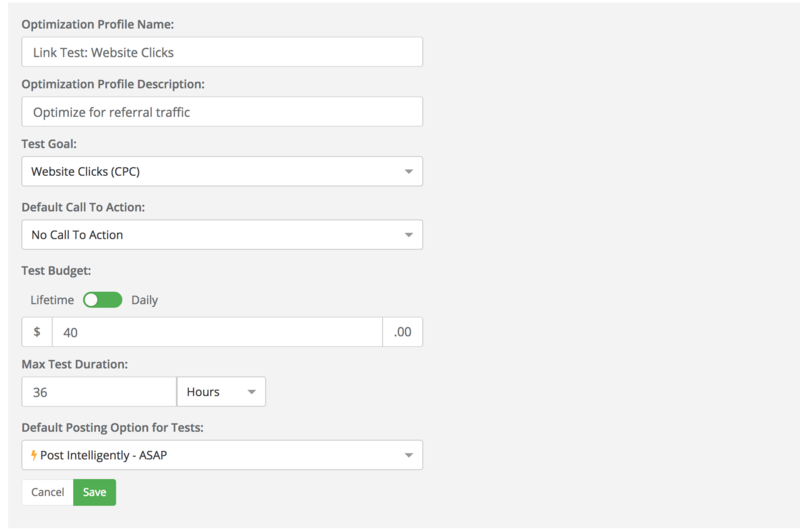 Similar to the optimization profile for Traffic, we allow you to customize your test budget, test duration and whether or not you'd like to use CTAs. Test your content to optimize for comments, shares, and reactions and get the right kind of attention from your audience.. Battle test your content, gather impressions and carry over tested engagement by publishing the winning message to your page and ensure that your content has a longer lifespan in the newsfeed. On platform engagement has never been more important. Now that Facebook has a focus on meaningful conversations - you can make sure that your content always leaves a good first impression. Our default optimization profiles allow you to focus on specific social conversions, but you can get additional granularity by pairing social actions to custom actions completed on your site. Using the Facebook Pixel, you can track and optimize showing your content to specific individuals that complete high value actions on your site - whether it be a purchase, an email subscription signup, initiating an app download, or more. Here are some common optimization profiles we've seen clients use to move the needle on their own metrics for success. By turning on Conversion Optimization and selecting the Facebook Provided "View Content" conversion event - you can find the best message variation that will get your social audience onto your site and viewing your video content as you intended. Videos on Facebook routinely do well, but ultimately the goal is to get social traffic to your main site. By connecting your Facebook Pixel, you can optimize and show your content to individuals that are more likely to click off of Facebook and onto your page. The Conversion Optimization profile for onsite content views is very similar to how we structure onsite video views. You can optimize to find the best packaging of your content that most compels your social audience to consume your content on your website. 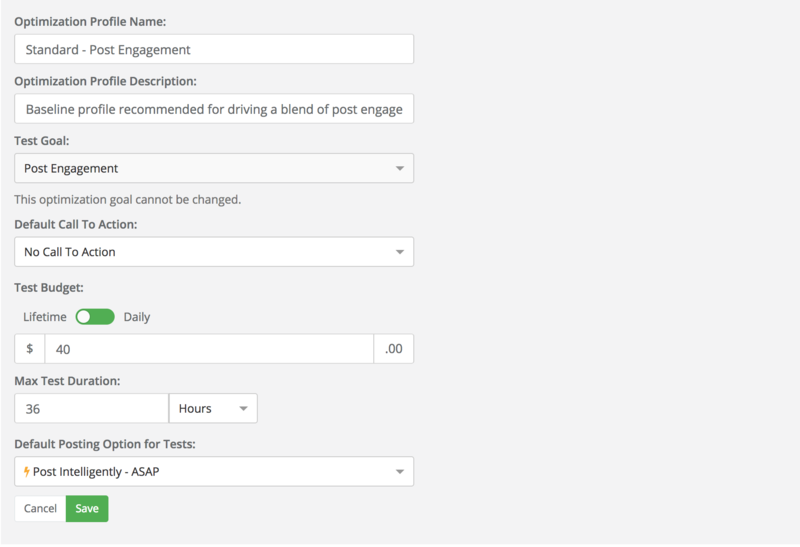 You'll change the test goal to conversion, select the Facebook provided "View Content" conversion event, and change the CTA to Learn More. Tracking how many people make it to your page is helpful to figure out a more accurate metric of social to site conversions. Track how many individuals actually make it to your site barring slow internet connections, leaving the site quickly, or moving to a different page. The Facebook Pixel provides essential audience data and tracks user habits on your site. Unlike the Viewing Content options, where Facebook provided Conversion Events were used, this will require a custom event created in the Facebook Event Manager by you or your tech team. 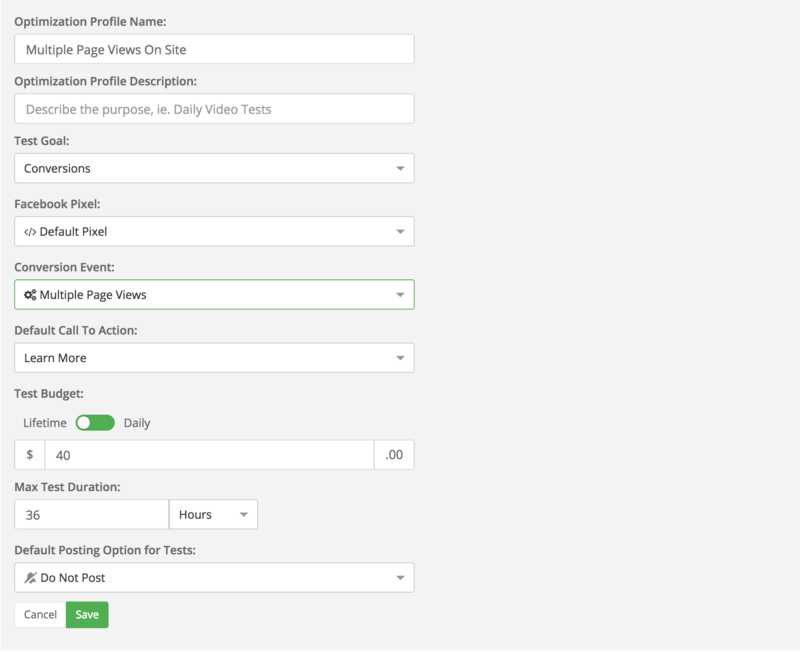 Once the custom event is set up, select the relevant Facebook Pixel, set your test goal as Conversions, and then choose your custom conversion event. In this case, we're optimizing for the content packaging that entices individuals to read multiple on-site articles. Using the Facebook Pixel and event tracking you can even optimize for email signups and newsletter subscriptions. For this profile, you can either use the default Facebook Events "Lead" or "Completed Registration" or use a Custom Pixel Event that you or your tech team defined. If you're using the default Facebook Event, make sure that you have the "value, currency, content_name, and content_category" parameters defined. If you'd like more information about default events and their parameters, here's a link to the official document from Facebook. You can also easily optimize to show your content to individuals who are more likely to purchase merchandise from your site. By using the default Facebook events, like "Add Payment Info", "Add to Cart", "Purchase", "Initiate Checkout", or by creating your own Custom Facebook event you can track where your customer is in their lifecycle, when merchandise is purchased, completed check-out sessions or when someone hits a "Thank You" page. If you're going to utilize Facebook's Default Pixel events, please make sure that you have the corresponding parameters set up on your site. This will ensure that Facebook can accurately track all actions that you deem valuable. If you'd like more information about default events and their parameters, here's a link to the official document from Facebook. 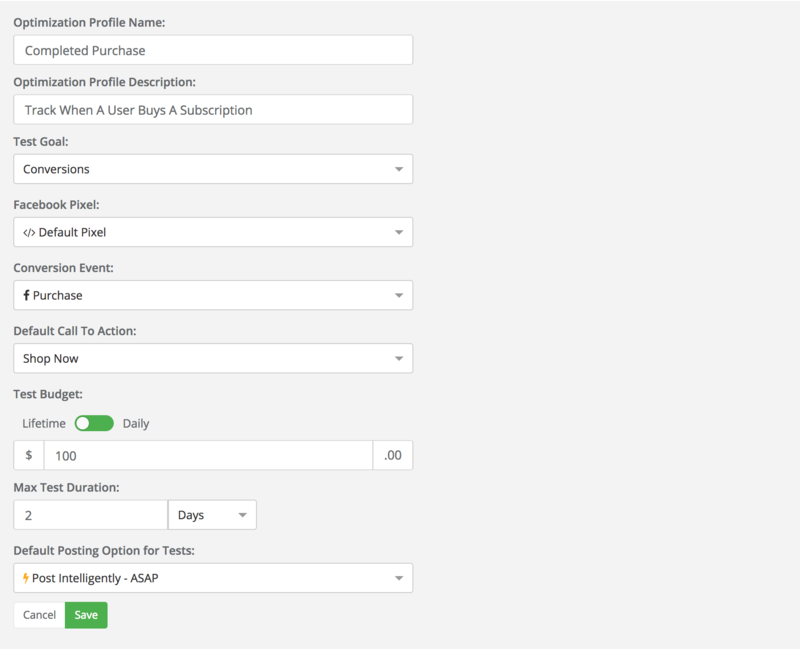 Like with other optimization profiles, customize the call to action, test budget, duration etc. You can also optimize to have your content shown to individuals who are more likely to click on your affiliate links using Pixel Events. Since this interaction is slightly more complicated, you'll need to use a Custom Pixel Event to accurately track your interactions. Learn how to create Custom Pixel events here. Once the custom event is set up, select the relevant Facebook Pixel, set your test goal as Conversions, and then choose the custom conversion event that you created. 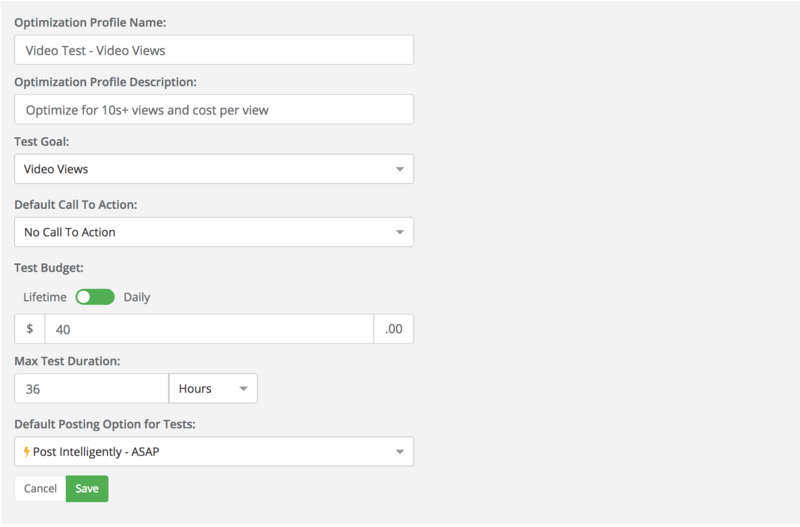 Like with the other optimization profiles, you can customize your default CTA, test budget, and test duration. If you have a smartphone app that you want to direct users to download, you can optimize for that as well. Instead of choosing conversions in the "Test Goal" field, choose App Installs instead. As long as your Application is properly set up in the Facebook Business Manager, we'll automatically pull in the deep link to the Apple and the Android stores. Customize your profile with your desired call to action: Use App, Download, Install Now, etc. You can also optimize for specific events within your application - not just application installs! If you want to optimize for users that have finished a tutorial, reached a certain page within your app or have undertaken a specific action, you can do that with in-app events. Since this event is more complex than setting up default or custom pixel events, you'll need to bring your tech team in to make sure that your In-App Events are properly being attributed to your Facebook Pixel. Here's the official Facebook Developer Document on setting up In-App Events. 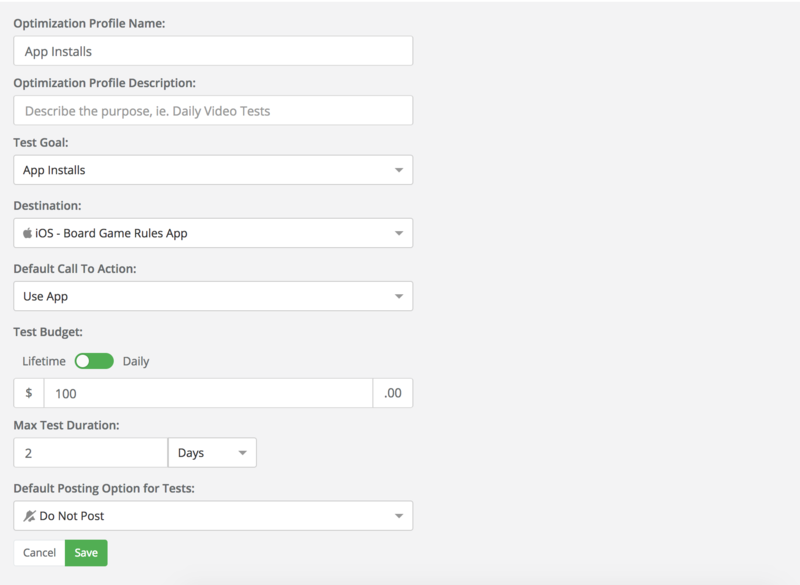 When optimizing for in-app events, you're going to create your optimization profile with the Conversion Test Goal. Like the default and custom events that are associated with a specific Facebook Pixel, custom in-app events will automatically be detected and drawn in by Naytev. Select the correct Facebook Pixel, the relevant In-App event, and customize the rest of your optimization profile. Learn more about conversion optimization below.